Bittergourd has many beneficial properties to health. It can be eaten raw or cooked. The Chinese have long regarded bittergourd to have medicinal properties and incorporates it in the doctrine of 食疗 dietary healing. When it is raw, it is packed with lots of vitamin C amidst other trace elements. It is regarded to have “cooling properties” 性味偏寒，with the ability to remove “heatiness” , and is very good for the heart and eyes 清热去火、清心明目. When when it is cooked, the properties changes entirely! It is said to take on “warming properties 性味偏温. Why drink bittergourd soup when it has “warming properties then? Does it help to relieve heatiness? Well, there is a well-known saying in an ancient text for traditional Chinese medicine called 黄帝内经, which states that we should “冬吃萝卜夏吃姜”. This literally translates to eating “white radish/daikon” in winter and ginger in summer. Precisely because it is heaty in summer that we should be consuming foods with warming properties like ginger or in this case, cooked bittergourd. It is said that as our body uses its inner energy to expel the heatiness, our constitution weakens and turns cold. So some foods with warming properties actually help to rebalance the levels of yin and yang energies in our body. As such cooked bittergourd is actually good for boosting and balancing the “yin energy” in the body 滋阴养血 in times when it is too ”heaty” 阳火过盛. It is believed to benefit the spleen and the kidneys 健脾补肾， which leads to a school of thought that it is good for diabetes. It seems to have been scientifically proven as bittergourd helps to lower blood glucose levels and also lower dietary carbohydrate digestion and reverse insulin resistance. In this soup, a sourish component is added to help whet the appetite and make it moreish! Usually 咸菜 salted vegetables are added. However, salted vegetables are said to be extremely “cold” 性寒 and not suitable for consumption. Instead, pickled sour plums or in my case, asam gelugor could be used. 2 sets of fresh fish bones and heads from whole meaty fish which are 1 kg and above each (threadfin 午鱼, white or red snapper 红鸡/红鲷, barramundi aka seabass 金目鲈 are all excellent choices), chopped into large pieces. Flesh can be filleted and added later or saved for other dishes. Add chopped fish bones and heads and pan fry until slightly golden brown. Add sufficient water until it covers all the bones and bring to a rapid boil under high heat. When the water boils, add pork ribs and turn down the flame to medium high. Skim off any scum that forms on the surface, add asam gelugor slices and allow to boil for 15-20 min covered. Meanwhile, prepare the bittergourd by halving it lengthwise. Use a teaspoon to scrape out the seeds as well as the velvety whitish membrane adhering to the flesh as much as possible. Cut into chunks and rub the chunks with 1/2 tsp of salt for 10 min. Pour away the soaking bring, rinse and drain again. Set aside for later use. The soup should look opaque and develop a beige/light brown milky coloration by now. Add bittergourd chunks and continue to boil for another 10-15 min. 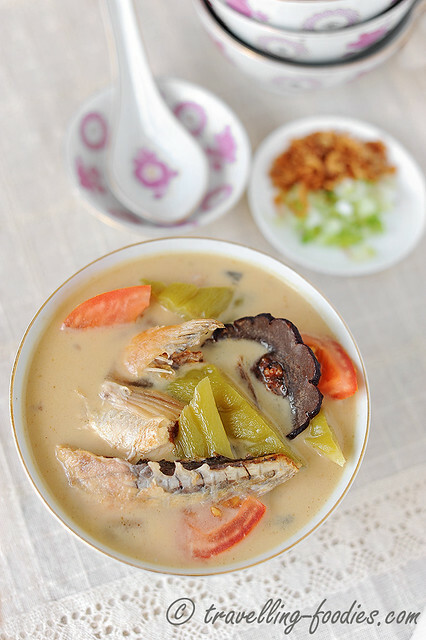 While the soup is boiling, add tomato chunks, and if using, the sliced fish fillet removed from the two whole fish. Cook for another 45 s to 1 min but no more than that. Turn off the heat and add a splosh of brandy or shaoxing wine. Ladle into bowl and serve immediately with rice and other dishes. This entry was posted on June 12, 2014 by Alan (travellingfoodies). 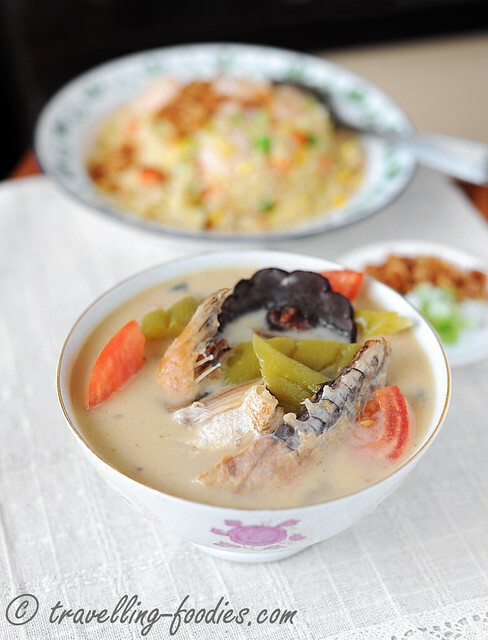 It was filed under Food, Simple Eats and was tagged with Bittergourd & Fish Bone Soup, 苦瓜, 苦瓜鱼骨汤, 鱼骨, 鱼头. 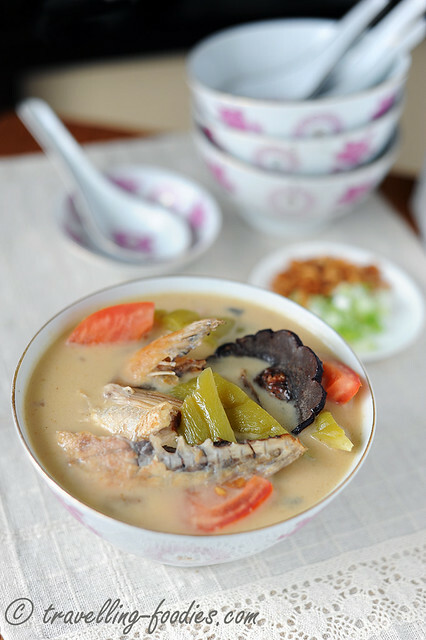 I love making soup with fish bone. Interesting that you combine with bitter gourd. Next round I shall try coz I need to mask this with the fish bone soup which my kids love.